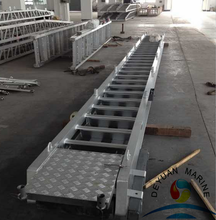 Our accommodation ladder was made of high quality aluminium or steel in a wide variety of sizes and styles,was designed to contact with a ship,it can be mounted parallel or perpendicular to the ship's board,and can be stowed and deployed easily when needed. 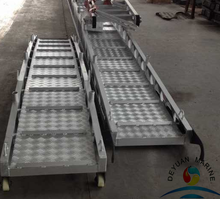 complete set of accommodation ladder should inclue ladder,turnable upper platform,lower platform,handrails,davit with winch etc. 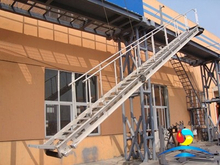 All our Acc.ladders are tested according to the standard of ABS,LR,DNV,RINA,BV,CCS,BKI etc. 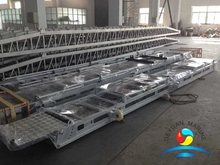 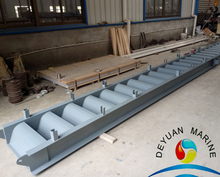 All accommodation ladders can be manufactured according to client specifications,if you are in need of it,pls donot hesitate to contact our sales team at any time.